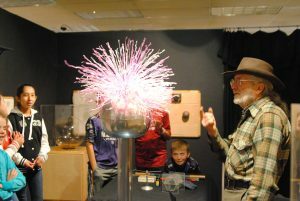 Museum Curator and Co-Founder Jonathan Winter does daily educational demonstrations, this one in the Static Electricity Lab. Photo courtesy: Spark Museum of Electrical Invention. Since I was a small child, I’ve been fascinated by how—and why—our world works the way it does. That’s why my family and I love The Spark Museum of Electrical Invention, covering the dawn of the electrical age as early as the 1600s, through the Golden Age of radio in the 1920s, and up through the evolution of today’s modern technology. Their otherworldly MegaZapper Electrical shows each weekend are a once-in-a-lifetime experience. But just as fascinating as their 39 separate exhibits is the story conveyed to me by founders Jonathon Winter and John Jenkins of how the museum came to be. Their story spans five decades and follows these two accidental heroes on a meandering journey. With help from a team of local businesses, friends and volunteers, these gentlemen made Spark their living legacy—preserving history and educating generations to come. 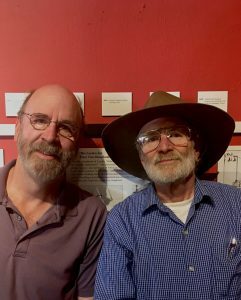 Spark Museum of Electrical Invention was founded by CEO John Jenkins (L) and Curator Jonathon Winter (R). 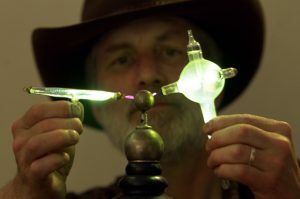 Photo courtesy: Spark Museum of Electrical Invention. Winter, now Spark’s Curator, first began collecting radios at a young age. By the time he and his wife moved to Bellingham from California almost 40 years ago, he had an extensive collection of radios made and used from about 1915 to 1926. The collection was too large for his home so Winter found the Marketplace Building in Fairhaven—now Sycamore Square. Instead of hiding his collection away, Winter opened the Bellingham Antique Radio Museum on his own dime. “I had a true desire to share this collection. It was really just a glorified storage unit,” recalls Winter. By the late 1990s, a group of Winter’s friends encouraged him to transition his museum to non-profit status. Many of those friends became the museum’s first Board of Directors. Although he’d previously been on the board of the Pacific Science Center in Seattle, Jenkins declined at the time to join the board because he was traveling the world on behalf of Microsoft. Co-founder Jonathon Winter demonstrates and repairs pieces in the museum’s collection, including items that were once part of his personal collection. 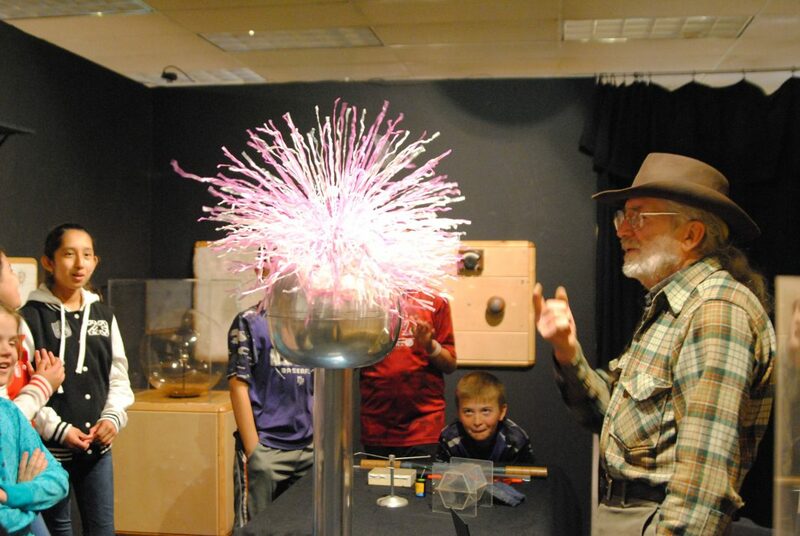 Photo courtesy: Spark Museum of Electrical Invention. Around 2000 and 2001, the new board decided that the museum really needed more space to be effective. Jenkins retired from Microsoft, moved to Bellingham and joined the board but that was just the beginning. “I was pretty dismayed at the economic decline of Bellingham’s downtown. Like many towns of the time, the invention of the mall really had an impact,” remembers Jenkins. “It was really hard on me because as a kid, downtown was where we went to get back-to-school clothes and Christmas shopping. Going to town was a special thing. It made me sad to see what it had become. So I wanted to do something direct that would help.” Jenkins started attending the Downtown Bellingham Partnership meetings. There Jenkins met Alice Clark of the Pickford Theatre, then located only in the Limelight on Cornwall Avenue. At the time of the move, the museum wanted a broader impact, so they changed their name to the American Museum of Radio. By that time, Jenkins’ own private collection had grown to become one of the largest of 19th century electromagnetic apparatus in the world. His items primarily pre-dated radio, those connected to key milestones in the early discovery and investigation of electricity. “John and I became very good friends and we both believed that the best use of our collections were as educational tools,” remembers Winter. So Jenkins moved his collection into the new space and the museum became The American Museum of Radio and Electricity. Jenkins’ collection includes one of the first 26 of Thomas Edison’s first successful electric lamps made in 1879 and a first edition book from 1560, one containing the earliest mentions of electricity and magnetism. The museum chugged along for several years with help from a bequest from the estate of former board member Robert “Bob” Foote. Although it was still drawing visitors from out of town, it was losing money. The board knew it would need to make changes and develop a new fundraising plan that would keep the museum safe for future generations. Over 4000 children participate in Spark’s hands-on educational programs each year, learning science without even realizing it. Photo courtesy: Spark Museum of Electrical Invention. According to Jenkins, the show is otherworldly. “It is sort of Franklin meets Frankenstein – science reality meets science fiction fun.” The centerpiece is the fantastic “Faraday Cage of Doom” designed and built by world-renowned sculptor Ric Allen. “It’s a huge draw. We went from 4,000 visitors in 2008 to 16,000 in 2009,” adds Jenkins. 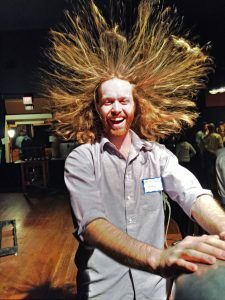 A Van de Graaff Generator makes static electricity fun for everyone. Photo courtesy: Spark Museum of Electrical Invention. Since 2005, Spark has also operated KMRE 102.3 FM, a non-commercial, community-based low power radio station. Thanks to support from tireless volunteers, KMRE presents over 50 locally-produced radio programs ranging from gothic radio drama to live civics education to psychedelic music revival. With the help of some dedicated staff, the Board of Directors and a host of volunteers, the museum is also making a regular economic and educational impact. The museum now offers fantastic rare artifacts, hands-on exhibits and exciting demonstrations to more than 20,000 visitors each year including school groups and local lovers like me. More than 60 percent of visitors are tourists from around the world. “In 2016 visitors who came from more than 50 miles away primarily to see us, spent over $1.6 million in the local economy here,” notes Jenkins. Whether you’re a collector of antiquities, a history buff, a fan of explosions and action, or a kid of any age, you’ll find something at Spark to engage your curiosity. But Spark is still working hard to ensure their future. They still need a greater percentage of their costs covered by grants and donations. 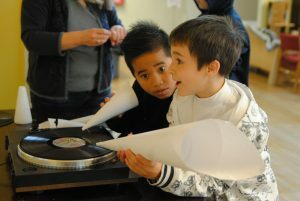 Those donations will support the fascinating hands-on exhibits, rare historic pieces, dazzling shows and community radio. Winter and Jenkins’ living legacy is a true gem in the downtown Bellingham and Whatcom County community. Spark is located at 1312 Bay Street and is open Wednesday to Sunday, 11:00 a.m. to 5:00 p.m. with the MegaZapper shows occurring at 2:30 p.m. each Saturday and Sunday.